After having our wedding at Nicotra’s Ballroom, I can’t imagine why anyone books anywhere else. We booked with Sue, and she was absolutely amazing from start to finish. She was so easy and fun to work with, and she really made the whole process seamless every step of the way. We held our reception in the Tea Room, which is absolutely stunning and perfect for photos; not to mention, the entire property has great opportunities for some really fun pictures (hello LOVE sign!) The food: if food is a priority for you, seriously look no further. The amount and variety of food at both the cocktail hour and reception were out of this world. Bonus; the staff really goes out of their way to make sure the bride and groom eat as well (I’m pretty sure I tried about 90% of the menu items we selected!) The whole team at Nicotra’s really goes above and beyond to make sure your day is perfect. I would recommend them in a heartbeat, and will absolutely book them for any future parties/events we host! I got married at Nicotra’s Ballroom at the Hilton Garden Inn on October 13th. Our cocktail hour was in the Trevi Garden and the reception was in the room with floor to ceiling windows. Our guest count was 164 and the the rooms did not feel cramped or to spaced out. The tables and dance floor where all layed out perfectly. We received many comments from friends and family about how amazing all the food was and how nice the venue is. Jennifer Finch, the senior events specialist, was very helpful and quick respond for anything we needed. We chose this venue because we felt that she was professional, sweet, down to earth, since the first time we met her. On the day of, I really felt like I was being taken care of. Bridal attendant ( Sabrina) and Maitre’d (Tom) were very attentive and made sure we have everything we needed. They both were around whenever we needed anything to drink, or help with my dress and shoes. The food by Nicotra’s Ballroom was amazing and exceeded my expectation. Everybody loved the food and the servers were great too. The entire Nicotra’s Ballroom team did a great job executing our wedding event. I highly recommend this venue to anyone looking to have the wedding of their dreams! The entire Nicotra's Ballroom team did a great job executing the wedding event. I highly recommend this venue. 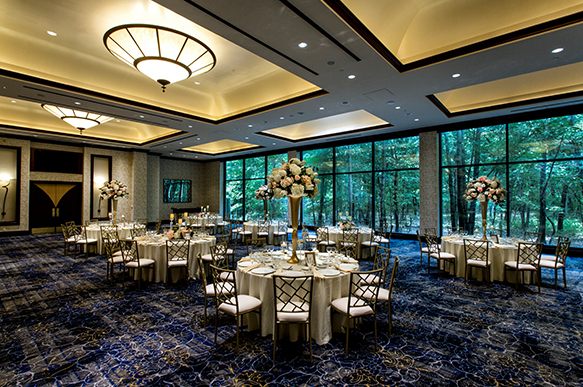 We highly recommend any couple who is looking for a venue to book Nicotra's Ballroom! Nicotra's ballroom was the perfect choice for our wedding. We just made our youngest daughters wedding here. One word would describe the wedding “amazing” Yes the venue is spectacular, yes the food was amazing. 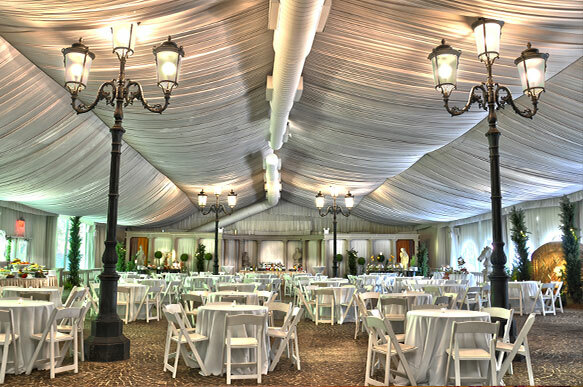 There are so many different event spaces that we utilized. The property has refurbished and looks spectacular. However, what really separates this location from all others is the staff. We worked with Sue Vaiana who was simply amazing as well. There is nothing that they said no to. An additional note on this location is that the Nicotra’s ( yes the developers of the hotel as well as many other properties in the area) were on site for the wedding. They are a true power couple who want to make sure the special day for my baby girl would be spectacular, and it was. I would highly recommend this venue. It has everything and will make that wedding that your daughter has been dreaming about and planning since she was a child a reality. Lastly , I think the best way to sum up how we feel about Nicotra ‘s Ballrom is what I told my wife after the wedding was over. I told her I had no regrets about anything we spent our money on. We got our monies worth and more. I am the third person to have my reception at Nicotra's out of my family, and I would not have it any other way! From the moment we walked in to view this venue until well after our wedding day (6/9/18), the staff at Nicotra’s Ballroom went above and beyond to make our wedding truly magical. All of my guests loved how comfortable they felt in the Trevi Garden and of course they thought the food was amazing! The venue is beautiful, typical Italian precision to detail at its finest but even better, the food, the drinks and the IMPECCABLE service. My husband and I had an amazing time and were treated like royalty all day; from getting ready at the hotel, to the beautiful outside ceremony, to the delicious cocktail hour and of course the fabulous reception. The Hilton is a venue/hotel that will surprise you in many ways. This was my husbands and I 3rd venue to look at , but it felt like the most obvious choice to pick. 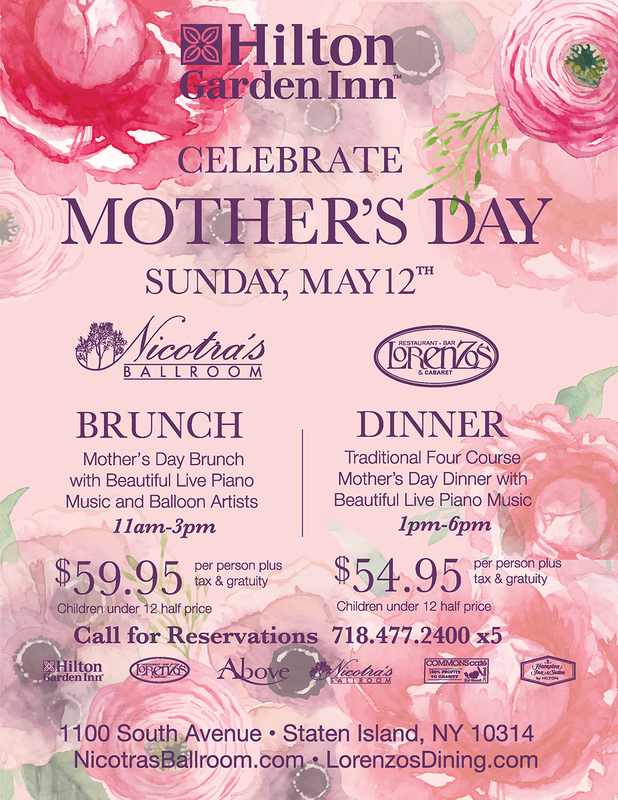 Every bride has there check list , the Hilton Garden Inn Staten Island ( Nicotra’s Ballroom ) will most likely fulfill them and more . Our Check list 1. 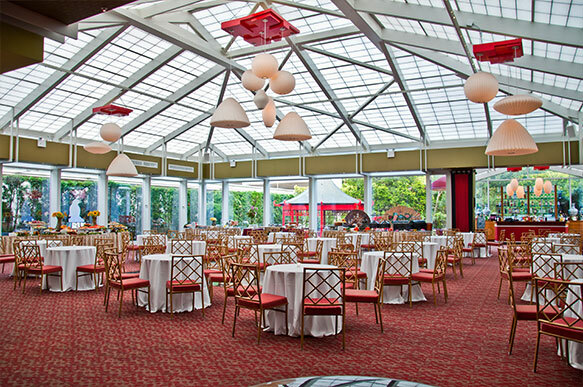 Large venue ( fitting 275 guest + “comfortably ” which is the key word) 2. Large Cocktail Room , with enough seating for guest. ( keep in mind venues will say they can fit 200+ , but in reality , there isn’t enough seating for all of your guest , they will have tall tables and ladies ,we all want to sit down when we have those high heel on ) 3. Shots allowed – Some venues will not allow shots for your guest . 4. Pricing ( ladies and gentlemen one of the biggest cost with your wedding ) My biggest advice , don’t go Hall hunting until you factor in the , Plate Cost( Including Tax and Gratuity ) x Guest Total = 1. Prices of Plates for the Weekend and Month ( Friday Saturday and Sunday ) – Wait for it , price does not change on the day/ month you pick at the Hilton ! You don’t have to negotiate a price for a certain day you prefer . This was the biggest relief ever ! 1. Big Dance floor 2. 2-3 Bars 3. On site grounds to take photos 4. Top notch Food 5. Hotel connected to venue ” very important to consider when you have guest out of town ” , If this doesn’t matter to you , understand this saves you a lot of money , we didn’t have to worry about paying for a shuttle service . As also your guest could go right upstairs and fall asleep . 7. Breakfast / restaurant for the guest the next day . 8. Location ( my husband is from Staten Island and I was from Monmouth county NJ) Other things on our list that we didn’t think to consider that the Hilton included – Wedding Cake / bakery included into price , Ice sculpture included , They assemble your sweetheart table , Tasting day with all meals My husband and I had a 320+ guest list , and the Hilton had more than enough room to seat the guest comfortable. We ended up with a 275 Guest Total in the end . Jennifer was our wedding coordinator and she has the patience of a Saint . She is on top of her game. Jennifer is there to remind you of all the things you need to do for the wedding to run smoothly . She is a very busy women , so always make an appointment to meet with her or email . The Hilton gave us the Trevi Garden for the cocktail hour , absolutely beautiful ! It fit all our guest and especially seated all our 250+ guest at a seated table . Amazing food ! I didn’t have one complaint about the food and honestly you won’t , the food at the Hilton is amazing . Cake was awesome ! Service was outstanding ! Price is amazing and you won’t be able to beat it for the quality of food you are getting . Location awesome ! Venue is huge ! Grounds are absolutely gorgeous, we took pictures on site and it saved us so much time ! Hotel convenience was amazing ! Dance floor was huge ! Also we were given the Nicotra’s ballroom ( 3 sections of it ) to fit all our guest. My husband and I paid for our guest breakfast the next morning .Service went well , my only negative comment would be about the Hilton is that the breakfast service waitress , were rushing me and my guest out . There might have been an event happening that day and I’m unsure if that was the reason. Don’t hesitate to check it out , call up / make an appointment , and just get prices before making many final decisions. I have been to a lot of weddings in my lifetime but this wedding tops them all! Our only regret is that we can't relive that amazing night! I Am Beyond Happy and Grateful!! Thank you and Mr. & Mrs. Nicotra so much for the thoughtful box of chocolates…they’re delicious. CONGRATULATIONS to everyone at the Hilton Garden Inn for such a wonderful anniversary! I can’t believe Moran has been coming to the Hilton Garden Inn for so many years. The Moran Company is over 160 years old and one of our locations is located at 2015 Richmond Terrace on Staten Island, which makes us local veterans. We’ve been holding our annual training events for many years before and when we saw that the Hilton Garden Inn was coming ­ to Staten Island, we were more than thrilled! The timing of the Hilton Garden Inn coming to Staten Island was perfect for us, otherwise during that time we would have been forced off Staten Island to another location. 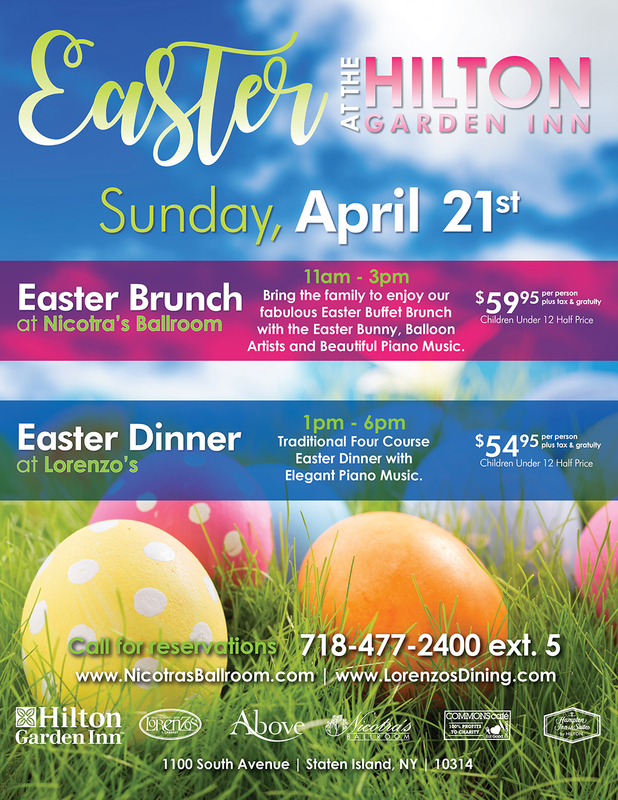 I have stayed at many Hilton properties throughout the country over the last 25 years and I must say that the Hilton Garden Inn at Staten Island is way at the top of being one of the best in the Hilton family. What has been created and maintained by all of you at the Hilton Garden Inn is the very reason we have chosen your hotel for all of the past years and is also why we always want to continue to return for many years to come. We want to thank you from the bottom of our hearts for everyone making us all feel like part of the “Family” atmosphere that exists at your hotel. We can’t thank all of you enough for your professionalism and how you are always so accommodating to all of our needs beginning with the scheduling and planning of the events, to the arrival at the hotel, everything in-between including all the way thorough to when we all check out to return either back home or work. I must also mention that it is so wonderful to see Mr. & Mrs. Nicotra present at the hotel on a frequent basis and for both of them taking the time and effort to notice us and just popping in to say hello. Thanks to everyone at the Hilton Garden Inn for doing your jobs so well, keep up the excellent work and we wish you all the best of luck and happiness for many decades to come! p.s. thank you and Mr./Mrs. Nicotra so much for allowing the use of the “Rooftop” meeting space for this week’s event. It goes to show how you are all so accommodating to us. I would like to share that it was a pleasurable experience for all of us at Moran. We would be the first to volunteer to return to the “Rooftop” is you were running short on meeting space again.